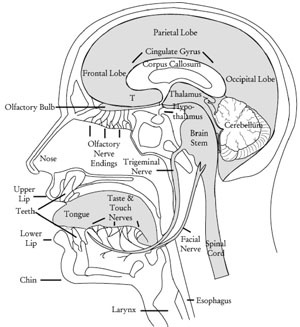 As diagrammed in this image, the three taste nerves and the trigeminal nerve bring their messages to the brainstem, where they combine their signals in areas that are involved with arousal (for example from sleep), and are - according to Antonio Damasio in "The Feeling of What Happens" - the locus of our sense of core self. the part involved with speech, also in the temporal lobe - in fact, smelling some perfumes can actually inhibit your ability to speak or even to think in words, so you are left with visual thinking. We have to know what we are eating, so taste, trigeminal messages, and smell meet in a part of the brain called the anterior insula (not shown in the image above), which identifies what the flavor is. But it is not enough knowing what the flavor is. We also need to react emotionally to what we are eating: do we like it? is it poison? should we enjoy it or spit it out? Therefore flavor messages also go to the emotional centers in the temporal lobe and the cingulate gyrus (see image above) involved in giving sensations an emotional coloring. Messages from all of these areas then reach parts of the orbitofrontal cortex in the frontal lobe of the brain, right above the eyes, in an area right next to the anterior insula. This part of the brain evaluates experience and chooses among alternatives - in the case of flavor, to eat or not to eat (see Dana Small and colleagues' paper "Experience-Dependent Neural Integration of Taste and Smell in the Human Brain" in the Journal of Neurophysiology, September 2004 Vol. 92 no. 3, 1892-1903.). In this same article, Small and her colleagues also discuss their finding that whether we think a smell is familiar or not depends on pairing the smell with the taste that usually accompanies it. In their experiments, vanilla odor paired with a sweet taste made the vanilla odor familiar, but when it was paired with a salty taste, the same vanilla odor was unfamiliar. This finding helps to explain why we often say that certain odors are "sweet" - we have paired the odor with the sweet taste in our memory. Finally, Small and her colleagues present strong evidence that the final common pathways of pleasant taste and smell go to the non-verbal right brain, which has implications for our ability to report thinking processes related to taste and smell; one of the reasons Titchener - and Wundt before him - only reported four tastes was probably that they had difficulty getting people to talk about taste and smell. Find out about individual differences in sensitivity! Functional magnetic resonance imaging, or fMRI, is a powerful tool for watching the brain at work. In order to perform an fMRI, the person puts his or her head in a giant magnet. When the magnet turns on, it causes molecules in the brain to change position ever so slightly, then return to the original position when the magnet is turned off. Very sensitive detectors measure these movements. When a part of the brain is active, the movements are different because of the increased blood flow through the active brain tissue. In this way the researcher can take pictures of the brain as it processes information from our sensory systems. One of the people who have studied taste and smell extensively using fMRI techniques is Dana Small, currently at the John B. Pierce Laboratory and Yale University in New Haven, Connecticut. Currently Professor Small is applying her techniques and her understanding of the flavor system to an exploration of the relationship of flavor perception to the development of obesity.